In the weeks leading up to “the big move” I pretty much gave up on trying to make and photograph food at dinner time. I was usually too tired after work to put the proper amount of effort into it, the lighting was terrible, and I just couldn’t get into it. It’s also kind of hard to get motivated to make a whole meal when it’s just you you’re cooking for. On my own, I could happily eat noddles with a little olive oil, garlic, squeeze of lemon and boat load of cheese almost every night for dinner. But during the day (I had a break while the girls were in school) I had much more energy and of course was always looking for an excuse to do anything other than pack my apartment. So I found myself making a lot of my big meals for lunch. This fish was one of those mid-day meals. I’ve got to tell you, it was one of the best lunches I’ve had in ages. It’s been over a month since I made it and I can still taste it when I think about it. The chipotle adds a deep smokey flavor that balances out perfectly with the lightness from the citrus in the orange juice. Then there is the punch of cilantro and the little bit of butter makes everything melt together. It’s also great because it’s basically a one dish meal with easy preparation and clean up. Definitely something you should try. 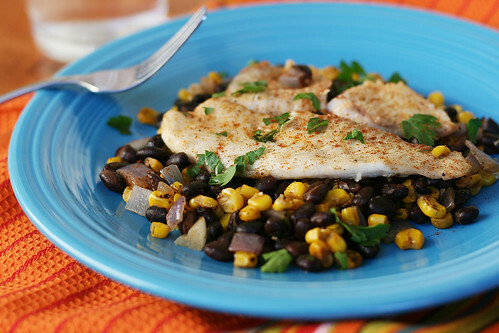 I used Tilapia because it was on sale at the grocery store, but pretty much any mild white fish will work. 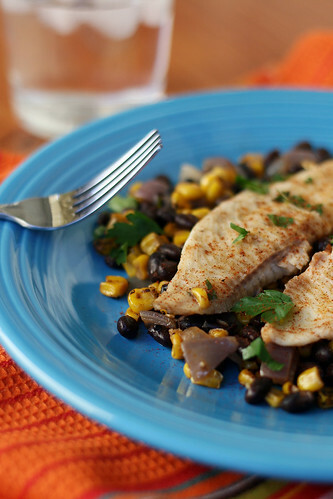 If you’re worried about it being too fishy, try using a fish like mahi mahi since it’s flavor is even milder. Also, I found this recipe on Pink Parlsey and this week Josie shared a spin-off recipe using chick peas instead of black beans. Sounds interesting! Preheat oven to 450 degrees and adjust rack to lower middle position. Pat the fish fillets dry and season lightly with salt and pepper. In a small bowl, use a fork to combine the softened butter, 1/2 of the chipotle pepper (or chili powder), orange zest, 1/4 tsp salt, 1/4 tsp pepper and half of the garlic. Spread the butter mixture over the fish. In a medium bowl, combine the black beans, corn, red onion, 2 tablespoons of cilantro, orange juice, remaining chipotle pepper (or chili powder), remaining garlic, and salt and pepper to taste. Lay out 4 squares of aluminum foil and divide the bean mixture evenly between them. Place one fish fillet on top of the bean mixture on each sheet of foil. Fold the foil in half over the fish and then seal all of the open edges by folding the foil edges up and in. Carefully move the foil packets to a baking sheet and bake for 15-20 minutes, or until the fish is just cooked through. Carefully open the packets, sprinkle with remaining cilantro and serve. As I slowly come out of my Christmas cookie induced coma, I thought it would be nice to share a recipe that is savory, delicious, and way more nutritious than Christmas cookies! It seems like everyday I add something new to my already long list of new recipes to try. Occasionally I come across a recipe that can not be kept at the back of the line. 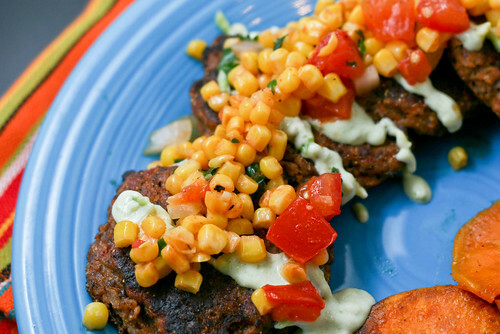 That’s exactly what happened when I saw these Black Bean Patties on Elly’s blog. She had me at black beans and sealed the deal with avocado cream sauce. We really really loved these and the only reason I didn’t blog these right away is because I was so busy trying to get all of my Thanksgiving recipes up I forgot, then I moved right into Christmas cookies. I think it’s worked out nicely though, I could use a break from holiday food just as much you probably can. So even if you have to wait till the week after Christmas to make these, that’s fine. Just make them! It will be welcome change of pace from a lot of the heavy holiday food you’re undoubtedly consuming. *As is, this recipe makes a ton. It could easily be cut in half and still feed 2 or 3 people a good size dinner. Add 1 can of black beans, 1 roasted red pepper, eggs, oregano, cumin, garlic, and the chipotle pepper to the bowl of a food processor. Process until combined and smooth. Add the finely diced onion and pulse to combine. Add the other can of black beans and roasted red pepper and give it a few 5-10 second pulses. You want it to be combined but not not completely smooth. Transfer the black bean mixture to a medium bowl and season with salt and pepper. Stir in 1/2 cup corn meal/bread crumbs. Add more cornmeal/breadcrumbs as needed to form a firmer mixture that can be rolled into a ball between your hands. Place the mixture in the fridge and allow to chill for at least 30 minutes. Remove the mixture from the fridge and shape into 3-inch patties. Heat canola oil in a large non-stick skillet. Add the patties in batches and cook, flipping once, for 5-7 minutes. 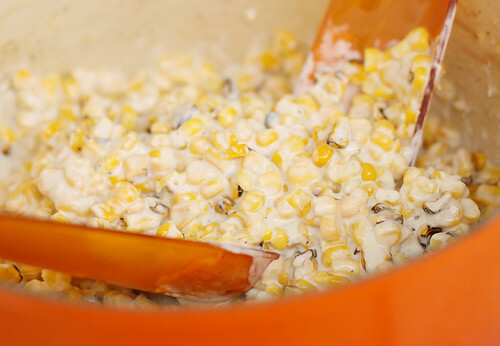 To make corn-relish, heat canola oil in a medium skillet. Add the corn and cook for 2 minutes. Add the garlic and jalapeno and cook for another minute. Remove the skillet from heat and stir in the rest of the ingredients. 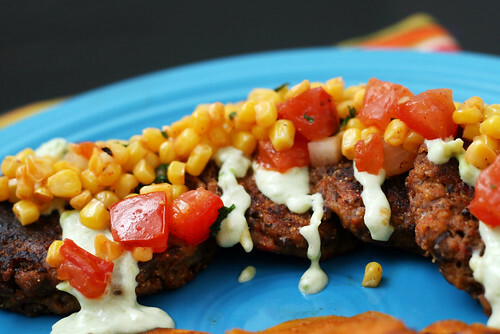 Top the cooked patties with the corn-relish and avocado cream sauce. * If you don’t puree your ingredients, then please don’t try put them in a squeeze bottle. A clogged tip on the bottle and lots of squeezing can only end one way, a mess. I may have first hand experience with that. Well, the BBQ Turkey Burgers I posted last week were very well received. I am going to go out on a limb and say it was all that cheesy goodness on top that drew people in. But it wasn’t just the delicious cheese, juicy burger, or savory BBQ sauce that made that meal. The side dish really set that already amazing burger over the top. That side dish was creamed corn. No wait! Stop! Don’t click away. 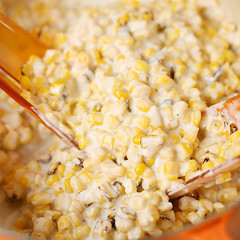 This isn’t your mushy, sodium laden, canned creamed corn. 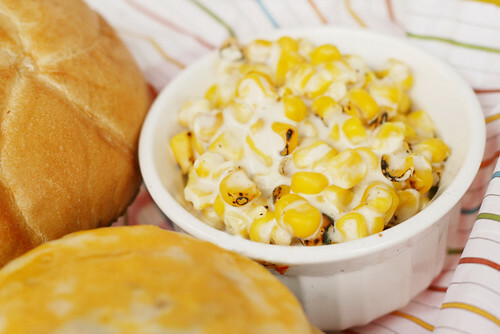 This is homemade, creamy, corny, goodness. I promise. And even better, it’s easy! Here’s a few notes about this recipe. First, I had a bag of roasted corn from Trader Joes and it was an awesome addition, but I don’t think it’s a make or break for the recipe. If you have it, use it, you’ll like it. If you don’t, no worries, it will still be awesome. Second, the recipe I used called for a crockpot. A crockpot would be great if you’re the type of person that plans ahead and can remember to put everything in the crockpot. Some people I know aren’t like that… I used a dutch oven. Bellow I’ll tell you how to do both ways just keep in mind that my personal experience was with the dutch oven. Third, I used frozen corn. Fresh would be even more delicious, but also a lot of work. Your call. Finally, I cut the recipe in half and it still made a ton (and I will list it below as I made it, if you need more you can double it). Now to the recipe! Place all ingredients in a dutch oven or oven-proof pot, over medium-high heat. Bring to a simmer and cook until all cream ingredients are melted and smooth, stirring occasionally. Cover the pot with a lid and bake for 30 minutes. Crockpot instructions – throw everything in the crockpot and cook on low for 4 hours. A few weeks ago I decided to challenge myself to two things: 1. To make pizza on the grill and 2. To try and clone my favorite from Dewey’s Pizza (this might be an Ohio thing, anyone know of any in another state?). Well this pizza knocked both things out of the park. I have made this twice now and I actually have decided that I prefer this pizza to the restaurant version because the crust is crispier and I can make it more cheesy. I am pretty proud of myself for coming up with this one, it really is awesome and you should probably make it ASAP! Grilling the pizza was surprisingly much easier than I had anticipated. I had visions of a perfectly good crust falling through the rack or it going up in flames. Thankfully, it did neither of this things. The most difficult part was flipping the pizza and the first time that was a little rough. This time I used 2 spatulas and let it cook a tiny bit longer on the one side so it would be more sturdy. I also put the dough right on the grill for the first side and then on an airbake pizza pan for the second side. That worked out great because I didn’t have to worry about moving the pizza from the grill to the house. Most recipes for grilled pizza call for smaller pizzas (like personal size pizzas) but I wanted a full size so that’s what I did and it worked out fine. But you could definitely make two personal size pizzas from this recipe and grill it that way. Preheat the grill making sure that it is really hot before putting the dough on it. While the grill is preheating roll the ball of dough into a 12 inch circle and place on an airbake pizza pan. (Take all of the ingredients outside with you because you assemble the pizza right there at the grill.) Grill one side of the dough for 3-5 minutes, watch your heat and adjust for any flare ups. Carefully flip the dough over (and back onto the airbake pan if you did the first half directly on the grill) and get ready to assemble. To assemble the pizza – spread the garlic butter over the dough, then pour on a little BBQ sauce, next add half of the black bean corn salsa, then the chicken and red peppers, then the a little more BBQ, then 1/2 of cheese and the rest of the black bean corn salsa and finally the rest of the cheese. After assembling the pizza turn the heat down a little and shut the grill lid. Let cook for about 5 minutes. Check to see if the dough is golden brown (carefully not to burn your fingers, use a spatula!) and if the cheese is melted. If it looks like it needs more time continue to grill checking every minute or so. In a pan saute the onion for just a few minutes to take out the bite. Then add the black beans and corn and heat through. Finish with salt and pepper, cilantro and lime juice.